What ethical issues do we face in providing robot care for the elderly? Is there better acceptance with the public? What should we be mindful of when designing human-robot interactions? 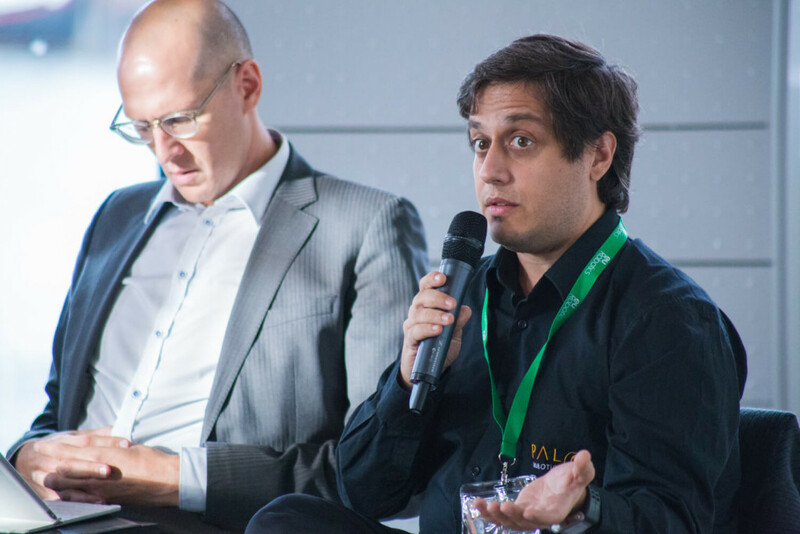 At the #ERW2016 central event, held in Amsterdam 18-22 November, these questions (and more) were discussed, debated, and encouraged by expert panellists hailing from research, industry, academia, and government as well as insightful members in the community. All were welcome to ‘Robots at Your Service’, a multi-track event featuring panel deliberations in robotics regulation, assistive living technologies, and aimed at attracting more youth, and especially girls, into science, technology, engineering, arts and maths (STEAM). The event hosted workshops and featured a 48-hour hackathon for designers, makers, coders, engineers, and anyone else who believed healthy ageing should be a societal challenge. 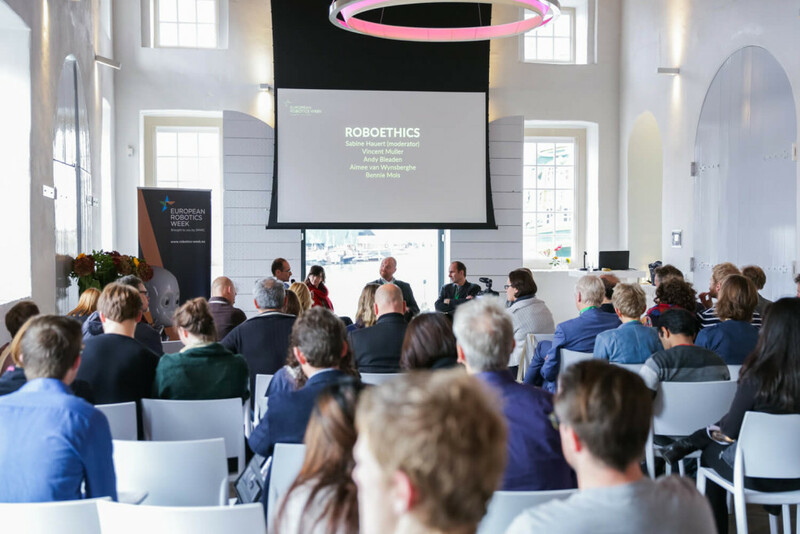 The first panel ‘Roboethics’ focussed on the role robots may have in elderly care and ethical implications. Should robots be regarded as tools, helping with administrative and manual tasks, and also as emotional support? The panel featured Sabine Hauert, (as moderator) President of Robohub and Lecturer at the Bristol Robotics Laboratory; Vincent Muller, Professor of Philosophy and University Academic Fellow at the University of Leeds; Andy Bleaden, Funding and Programmes Manager at Stockport Council with a background in social care; Aimee van Wynsberghe, Assistant Professor of Ethics and Technology at the University of Twente and co-founder of the Foundation for Responsible Robotics; and Bennie Mols, science and technology journalist with a special interest in artificial intelligence and robots. “What should we be mindful of when designing human-robot interactions?” asked Sabine. “One gentleman told me he’s much more inclined to have a robot nurse help him with showering and dressing, as opposed to a care worker,” said Andy. 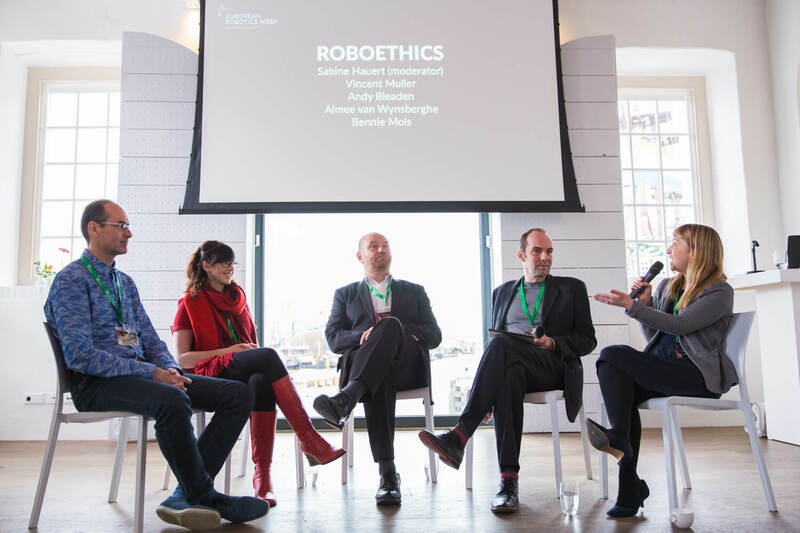 “What does the public think about robots for eldercare?” said Sabine. “Do we need an ethical framework to drive decisions?” asked Sabine. “Only a few years ago, people thought robots were too expensive and didn’t want to invest. Now it’s 3x different,” says Anne. “One thing is for sure. Robotics in our future need to be intelligent, otherwise, they won’t be very useful,” she said. “A few years ago, people were saying robotics was too expensive or people didn’t want to invest in robotics. Now, the situation is completely different. Why is this development now accelerating? Is it for profit, or is it altruism?” asked Uwe. “Is there more acceptance with the general public because of service robots?” asked Uwe. There was also discussion of the many advantages of conducting robotics within Europe. In part because of unique partnerships, like SPARC, but also the collaborative community working together. Indeed, the robotics community is starting to embrace a very global mindset and perhaps could do a bit more risk taking. “Europe is getting more entrepreneurial. Will this be a barrier for further development?” asked Uwe. The panel closed with discussions that robotics should be for everyone, and that, not everybody involved in robotics has to be an engineer. No country should be left behind due to lack of technology. In the future, and in terms of how robotics will be, we will need to rethink what we place value on (for example education or health care) and help provide opportunities to everybody. European Robotics Week is organised by euRobotics and brought together by SPARC, a partnership for robotics in Europe to help maintain and extend Europe’s leadership in robotics. ERW has attracted more than 200,000 people since 2011 to take part in robotics related activities. During the week, research institutes, universities, industry, and activities are open to the public to engage and learn more about robotics.